Travel is a gift that lasts far beyond the actual physical experience. At Perillo, family comes first and the travel experience is a great way to spend valuable time together away from every day life. 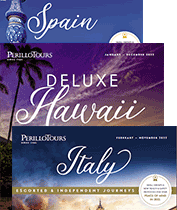 Our custom journeys spark new interests and create a lifetime of memories. Introduce your kids or grandkids to your own culture, or a different cultures and wonders of the world. Explore fun-filled journey where you’ll discover astonishing sites, engage in hands-on activities, and go off the beaten path for truly exciting experiences! For additional information call 855-784-7687 or email us.